Jimmy Paredes, celebrating with teammates after hitting a game-winning RBI-single last month, was one of six players outrighted off the 40-man roster on Friday. The Phillies offseason roster cleaning began on Friday afternoon when they removed a half dozen players from their 40-man roster. Outfielder Jimmy Paredes, infielder Emmanuel Burriss, left-hander Patrick Schuster, and right-handers Dalier Hinojosa, Frank Herrmann, and Colton Murray were all outrighted to Triple-A Lehigh Valley. None of those names are surprising. Or at least nowhere near as noteworthy as the similar roster cuts from a year ago, when former All-Star Domonic Brown, former top pick Kelly Dugan, and former catching prospect Tommy Joseph were among the roster casualties. Joseph, of course, was unclaimed by another major league team and went on to have one of the most surprise breakout seasons in 2016. 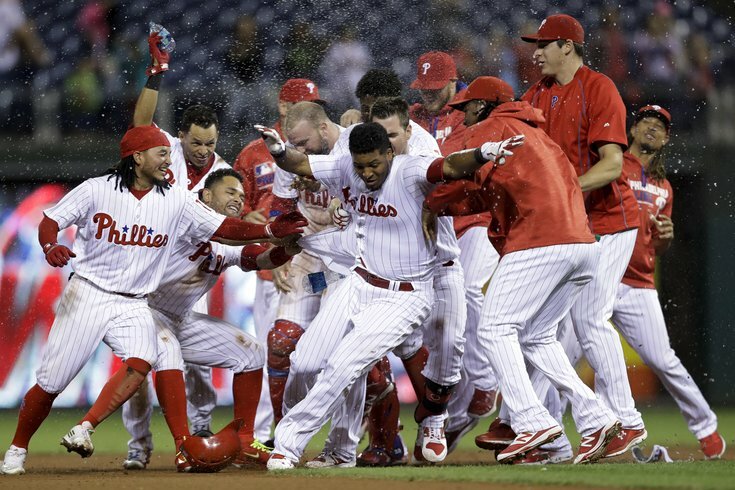 The Phillies currently have 34 players on their 40-man roster. But that 34 includes soon-to-be free agents (Ryan Howard, A.J. Ellis, Andres Blanco, Peter Bourjos, David Hernandez, Jeremy Hellickson) or the players who have to come off the 60-man disabled list and placed back on the 40-man roster (Aaron Nola, Zach Eflin, Matt Harrison). Charlie Morton is also on the 60-day DL, but is also likely to become a free agent next month when the Phillies decline his $9.5 million option. The Phillies will have to continue to create space on their 40-man roster in the coming weeks. They have nearly a dozen prospects that must be added to the 40-man roster this winter in order to prevent them from being selected in the Rule 5 Draft in December. Among those players: outfielders Nick Williams, Dylan Cozens, Andrew Pullin, Carlos Tocci, and Jose Pujols, right-handers Mark Appel, Ricardo Pinto, Ben Lively, and Nick Pivetta, catcher Andrew Knapp, and infielder Malquin Canelo. Per Rule 5 rules, players who were 18 or younger on June 5 preceding the signing of their first contract must be protected after four minor league seasons, and players 19 and older must be protected after three seasons.